When considering surgery for the treatment of primary hyperparathyroidism, accurate pre-operative localisation of the hyperfunctioning parathyroid adenoma is associated with successful resection of the adenoma and correction of hypercalcaemia using minimally invasive parathyroid surgery. Hyperparathyroidism is most commonly caused by a single parathyroid adenoma, while multiple gland hyperplasia is less common and parathyroid carcinoma is rarely encountered. Neck ultrasound is an excellent tool for the localisation of a single parathyroid adenoma and allows examination of the thyroid gland for thyroid nodules which are seen in up to 40% of patients with hyperparathyroidism. The presence of thyroid nodules requires preoperative evaluation and exclusion of thyroid malignancy and may change the surgical approach. Parathyroid scintigraphy is complementary to ultrasound with the added advantage of identifying an ectopic parathyroid adenoma outside the field of ultrasound imaging. Parathyroid ultrasound and scintigraphy are both less sensitive for the detection of multiple parathyroid gland hyperplasia. 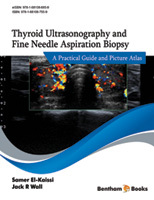 Parathyroid gland fine needle aspiration biopsy and measurement of parathyroid hormone in the needle washout confirms the diagnosis when parathyroid imaging is inconclusive.